Francois Avril’s career started with illustration. Sometimes working alone, sometimes in collaboration with scriptwriters, he produced many children’s books as well as comic strips that flirted with the French “Nouvelle ligne claire” or “New clear line” style seen in the work of Chaland, Floc’h and Ted Benoit. In common with his friends Loustal and Dupuy & Berberian, he took immense pleasure in creating narrative illustrations into which the reader could project his own story. The city remains his preferred setting, the place into which he can project his slender and elegant creatures. Paris was, at the beginning, his setting of choice. He captured the living pulse of the city of light and revealed a predilection for those areas that have retained their identifiable “village” quality. Rather than waste his efforts on replicating the august monuments of the city, he chooses instead to convey the street-level viewpoint of the passer-by. In doing so he echoes some of the Surrealists (Breton, Aragon…) who in their day elevated the act of aimless wandering to the level of art. Tokyo, New-York and Brussels would in time enjoy the same magical treatment. Though the fascinated observer might claim to recognize the tantalisingly familiar scene sketched by Avril, he has nonetheless been gently hoodwinked by the artist’s affectionate trickery, because Avril takes great pleasure in reshaping the cityscape to his own ends. This hint of deja vu invites the delighted observer to lose himself in this “other” place basking in harmonious colour. 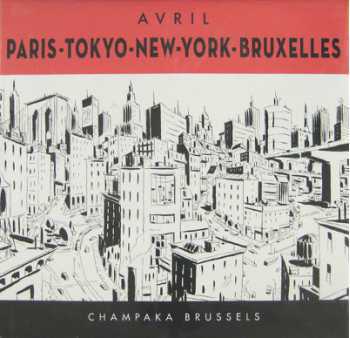 “Paris - Tokyo - New-York - Bruxelles” brings together his best of his delightful urban studies.